“CROSS”OVER: AIR RAID PRINCIPLES IN THE OREGON PASSING GAME! The “Air Raid” passing attack is among the most popular offenses in college football today, yet you can actually see components of it at Oregon! It has a passing philosophy and scheme that can trace its roots back as far as San Diego Chargers Coach Sid Gilman and BYU Coach LaVell Edwards (and my college head coach Larry Kehres), and the modern Air Raid offense continues to light up scoreboards across the country. The list of current coaches with Air Raid roots such as Mike Leach, (Washington State) Dana Holgorsen, (West Virginia) Kevin Sumlin, (Texas A&M) and Kliff Kingsbury (Texas Tech) are teams with highly efficient quarterbacks, gaudy statistics and lopsided wins. At first glance the pass-first Air Raid seems to have little in common with the run-first Zone Read system that Oregon has made famous. However, an analysis of the Ducks passing game shows elements of the Air Raid in both passing concepts and overall philosophy. This article breaks down the classic Air Raid “Cross” (or Y-Cross) concept that the Ducks have used in their passing game with great success. Let’s go! Watching the Oregon offense over the past few seasons it has been clear that much like the Air Raid, the Ducks are very much on the “have a small number of plays and run them well” end of the offensive spectrum. Any good passing play relies on all five receivers to run precise routes and get themselves into the exact location on the field that the pattern concept requires. Five well run routes build a precise pattern to attack specific weaknesses in a defense. The individual routes that make up a pattern concept work together to get not only individual receivers open, but to get their teammates open as well. One of the best models of route distribution and how routes work together to build a pattern is the Air Raid “Cross” example. 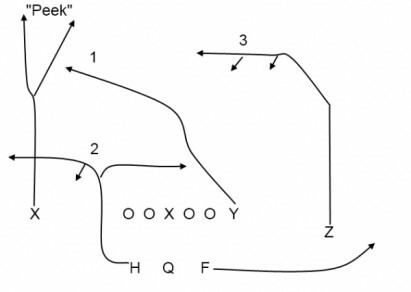 “Cross” (pictured above in ancient playbook hieroglyphics) is a classic Air Raid concept that stretches a defense vertically to then attack horizontally. The deep post or go route of the X receiver in the diagram above creates vertical stretch on the defense in the area of the field where the QB begins his read. The crossing/out routes of the H and Y create horizontal stretch on the underneath (LB) coverage. The backside dig or curl route of the Z tries to take advantage of the open areas in the defense created by the horizontal routes of H and Y. The flare out of the backfield by the F works to remove underneath coverage and free up the crossing route. These five individual routes work together to build a clear picture of Cross for the quarterback when he reaches the top of his drop. From play to play the QB never knows exactly where the defense will break down or which individual route is going to be open. However the QB knows that if his receivers are exact, fast and spaced properly, the read will be clear and someone will be in an open area. 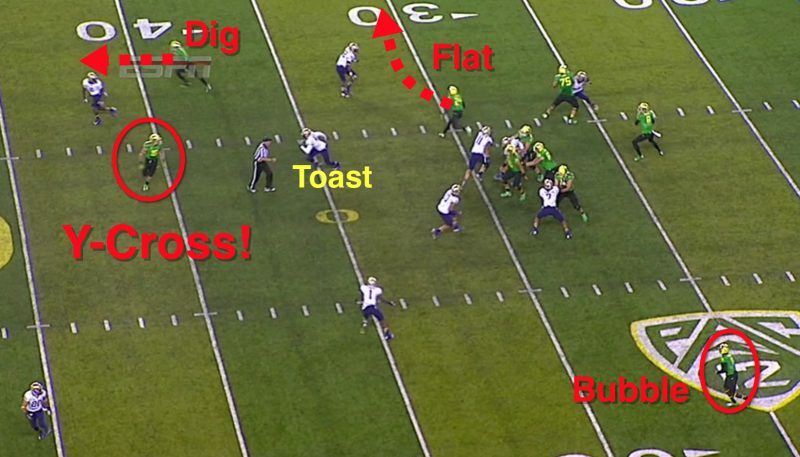 Oregon’s version of cross is very similar to the Air Raid concept with one minor exception. Instead of using a RB out of the backfield to create the horizontal stretch, the Ducks use the bubble action from the slot receiver. The success of the Bubble Read in the Oregon offense helps to move defenders out of the interior throwing lanes. 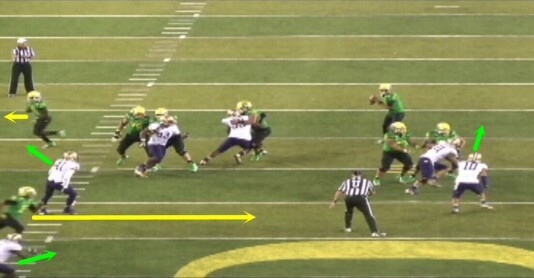 The Ducks will also add a token fake to the RB and show either Inside or Outside zone action. While this may appear to be wholesale play action, it is really not. The Oregon offensive line is in full drop-back protection mode; setting up back to pass-block with high helmets that indicate to the defense that it’s going to be a throw. In the diagram above vs. Washington in 2012, Oregon lines up in a formation with two receivers on each side. The QB starts by taking a look at the vertical route (1 above) into the boundary. If the deep throw is taken away by the safety, the QB’s read will progress inside to the crossing route (2 above). If the crossing route is covered by underneath coverage, the QB will work back to his curl route (3 above). The QB also knows the Bubble runner (green checkmark above) will station himself outside the numbers as a check-down if the QB gets in trouble. After the ball is snapped above, you can see the effect of the vertical threat on the corner and safety at the top of the picture. Both defenders work to take away the deep throw. The bubble and zone fake to the running back also help create an open area in the middle of the field (red circle). Washington’s LBs are out of position due to their respect for Oregon’s running game. Mariota sees the open window near the left hash and delivers the ball to the crosser for an explosive (and very Air-Raid looking) play. From the end zone view above you can see how the Bubble Read look from the Slot and RB keeps the Washington LBs close to the line of scrimmage. The Bubble Read action pulls the LBs out of the area of the field that the crossing route attacks! In this same game Washington (above) decided to line up in a one safety look in order to get an extra defender in the box. Oregon’s success running the ball has now forced the Huskies into a 3 deep 5 under (Cover 3) zone coverage look. While this look outnumbers the Ducks in the run game it also creates a great opportunity to use the Cross concept for a big play. At the snap of the ball five Washington defenders above rush to cover the three Oregon WRs working towards the top of the picture. The vertical (1), bubble (green checkmark) and cross (2) are all covered quickly by the Huskies. However, the route discipline of those same 3 receivers has opened up the backside curl (3). The crossing route has moved the curl defender out of his zone. Kenjon Barner’s speed to the flat after executing his fake has pulled the flat defender outside – leaving a great throwing lane for Mariota to connect with Josh Huff running the curl. Huff does an excellent job coming back to the quarterback and football to complete the catch. After the catch Josh Huff (above) shows why he is one of my favorite wide receivers. He plays a physical brand of football that all WR coaches appreciate, even when he has the ball in his hands. After catching the curl from Mariota, Huff tight spins up the field and attacks the Husky defenders. 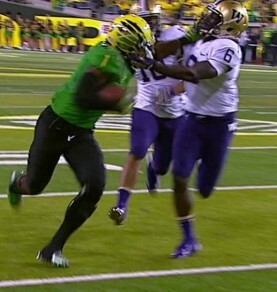 By carrying the ball in his hand closest to the sideline Huff has also freed up his left arm to deliver a stiff arm. The combination of aggressive and fundamentally sound play after the catch results in an Oregon touchdown! The Ducks will also run the Cross concept with a TE. 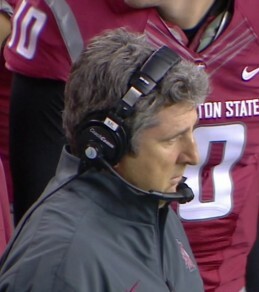 On this play against Washington, Oregon has three WRs, a RB, and a TE in the game. They compress the formation by bringing the WR to the top of the picture (Josh Huff) into a wing alignment next to the TE. This personnel grouping and formation shouts a strong run tendency from the Ducks. Despite the Huskies’ defensive coverage call, (Cover 2) the combination of the Ducks’ run predisposition and the token run fake will be enough to create an interior throwing lane into the defense. Despite the change in personnel and formation, the Cross concept still attacks the same areas of the field. Oregon’s skill guys are lined up in slightly different spots but doing the same job. The wing alignment for Huff allows him to compress and then attack the deep coverage to the boundary. The vertical (1), Bubble (check-mark) and cross (2) have the same landmarks as they did in the previous formation. The downhill Inside Zone fake looks to freeze the LBs and create the same opening in centerfield (red circle) we saw in the first play we analyzed in this article. The play (above) unfolds exactly as designed. The vertical routes at the top and bottom of the picture move the deep safeties toward the sidelines. The Inside Zone fake keeps the LBs frozen at the line of scrimmage, yet they are responsible for centerfield and seam coverage zones in their Cover 2 defense! With the defense moved out of position by well executed routes, Mariota finds a wide open Colt Lyerla in the exact location on the field where he is prescribed to be. 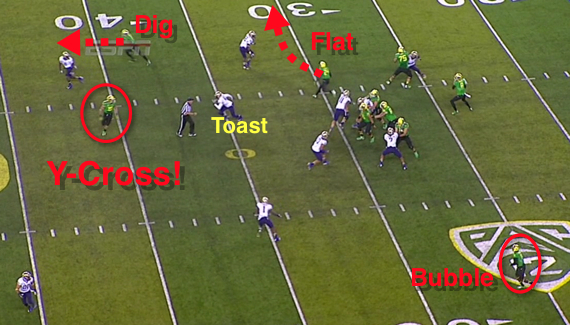 Five great routes work together on this play to create a huge chunk of yardage for the Ducks! The end zone view of this play (above) reveals how the vertical threat of Huff and the interior threat of Barner combine to occupy three Husky defenders! The obvious helmets-up drop-back pass protection from the offensive line is ignored as the threat of the run is so ingrained in the Washington LBs that they freeze with a token fake. The efforts from Huff and Barner help Lyerla run unimpeded into a wide open area of green grass in centerfield. (red circle) We love it! Despite the differences in name and perception, all great offenses all have some things in common. Great offenses attack all areas of the field. Great offenses keep things simple (run and pass), which allows their players to play fast. Great offenses create space and then get the ball to their best players in that space. Great offenses are also open to new ideas and borrow heavily from other great offenses. Great offenses make these borrowed concepts their own by tweaking them to the strengths of their players. The “Cross” pass pattern is a great example of how two completely different schools of offensive thought can use the same concept in their own unique and effective ways. Despite different ways of achieving their goals, the Oregon offense has a lot more in common with the Air Raid than most people think. Great minds don’t always think exactly the same…but they often think alike. I am excited to see what both the Ducks and the Air Raid schools come up with next…so we can borrow/pirate/research some of it for ourselves at Villanova! This is my last analysis of the summer as I am presently in Fall Camp with my Wildcats, but I have enjoyed creating these and look forward to more in the offseason. *Don’t miss our football analysis every Tuesday, our Recruiting Update every Wednesday and our new Chip Kelly updates every Friday!